BACK ON MARKET - Gorgeous Taylor Woodrow home in Resort Style Community of Waterchase in 33626! A versatile floorplan offering 4 bedrooms, 3 full baths, office/den, garage with split one car side load and two car front load on a premium pond front homesite that is fully fenced. You will begin to appreciate many of the upgraded features as you arrive at this fabulous home with exterior stone elevation, decorative moldings, gutter systems, covered front porch, glass double entry French doors, hardwood flooring, columns, crown molding, 12 ft ceilings, tray ceilings and so much more When you first enter you have a large formal dining room with hardwood floors and small dry bar station as well as a comfortable formal living room. The gourmet kitchen boasts 42 cabinets, granite counters, stainless steel appliances with gas range, center island, breakfast bar and a large dinette area. The spacious owner's suite with private patio entry affords walk-in closets and en suite bathroom with dual sink vanity with seating area, garden soaking tub and separate glass walk-in shower. There are three good sized secondary bedrooms sharing two full baths and a dedicated office/den with Other amenities to this great home include a dedicated office with hardwood floors, built in desks, storage, display shelves and tray ceilings. 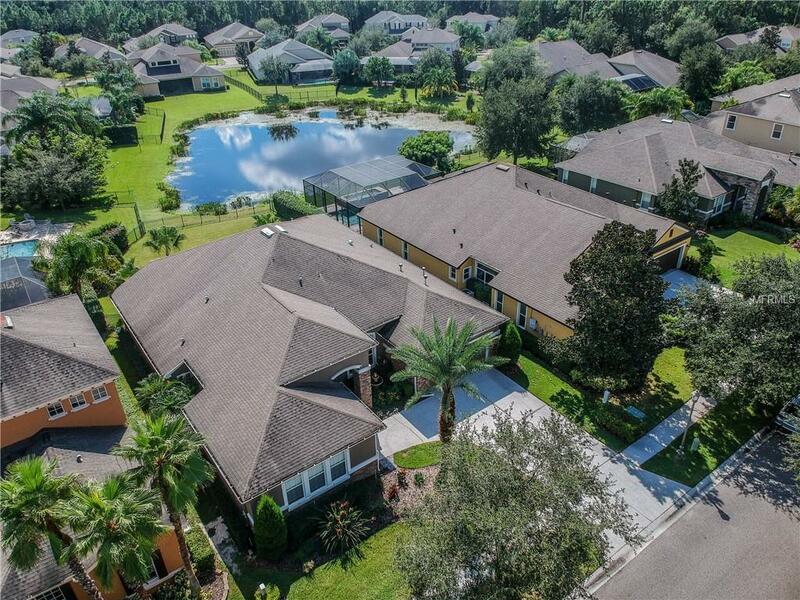 The Waterchase Community Center has two pools, a two story waterslide, fitness center, playground, tennis courts, clubhouse & more.. Zoned - Mary Bryant, Farnell and Sickles HS.